Cannabidiol (CBD) is one of over a hundred naturally occurring phytocannabinoids which is increasingly used as a preferred ingredient in dietary supplements due to its ability to alleviate a wide range of health issues including anxiety, pain, inflammation, insomnia, depression, epilepsy, and diabetes. It is widely accessible and legal in most parts of the world since it can be extracted from industrial hemp and high THC cannabis marijuana strains are not necessary for its production. While CBD’s counterpart, tetrahydrocannabinol (THC), is a cannabinoid compound associated with medicinal effects, its potential psychoactive effects are a cause for concern with some people and legal authorities. Furthermore, the therapeutic effect and interplay of all the additional phytocannabinoids have not yet been fully elucidated and further research is required. On the other hand, proponents of CBD products look to avoid the notorious “high” and revel in CBD’s body relaxant properties. Generally speaking, the main goal with cannabinoid intake is to maximize health benefits while minimizing the psychoactive effects associated with THC. Thus, where legally compliant, it does not mean that you should completely avoid formulations with THC as long as the THC dosage is sufficiently low that it provides medicinal benefits without triggering the psychoactive high. Surprisingly, it is often the case that the therapeutic dose of THC is lower than the dose required for psychotropic effects. High doses of CBD are also not always more effective than lower doses. A therapeutic effect can be achieved with as little as 2.5 mg of CBD combined with a tiny amount of THC. It is typically best practice to start with a low dose and gradually and patiently increase the dosage until the desired effects are achieved. However, the main focus for the rest of this article is on CBD oil dosage owing to the complexity of the legal matters associated with THC. Whether you’re an experienced user or trying CBD oil for the first time, it is important to understand how CBD works inside your body depending on the dose utilized. 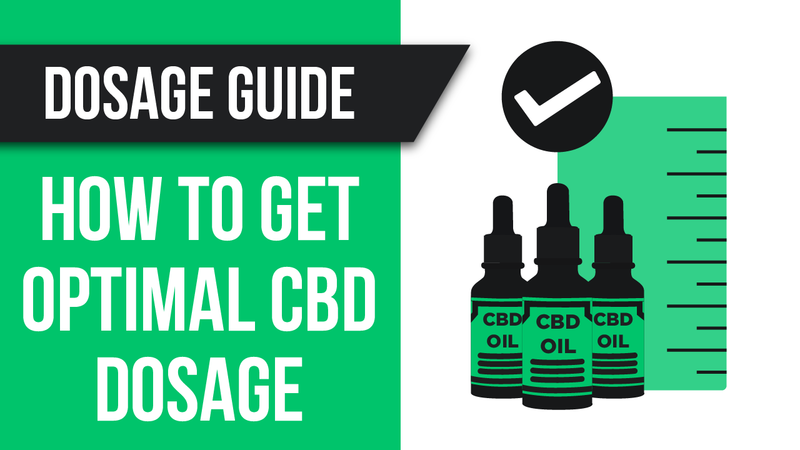 A lot of online resources focus on CBD basics and potential benefits, but few address the issue of dosage in sufficient depth. So, to begin with – what is the recommended daily intake for CBD? 1 The recommended intake for CBD? 5 How can you accurately measure your CBD intake? The recommended intake for CBD? Here is where things get even more confusing since the US Food and Drug Administration (FDA) agency does not have a Recommended Daily Allowance (RDA) for CBD, meaning that an official recommended serving size does not exist at present. Sounds like a lot of trial and error is required, right? Well, as you will notice throughout this article, trial and error is an inevitable part of CBD consumption! Unfortunately, this has helped create a marketplace that consists of a lot of quasi-experts and companies that tend to arbitrarily estimate their recommended CBD dosages. A better approach is to precisely control and monitor the amount of CBD that you consume daily through simple and effective methods and calculations. Our bodies tend to interact with cannabinoids differently and everyone needs to optimize their intake on an individual basis. Neuroscientists have already observed that the receptors in our Endocannabinoid System (ECS) change with our body’s physiology which, in turn, modifies the way our body interacts with CBD and THC. This leads to a potential life-long shifting of our individual CBD dosage requirements. However, there are some guidelines which can be used in order to estimate the CBD dosage necessary for your particular case depending on the relief you are seeking. These are only rough estimates and trial and error is essential in order to determine what works for you and what does not. Please remember that what works for you might not work for your best friend with a similar ailment and vice versa! Every individual is different and countless variables are involved when determining CBD dosage. These variables include but are not limited to body weight, genetics, metabolism, nutrition, medical history, previous cannabis usage, and so on. Thus, it is impossible to prescribe a universal CBD dose since CBD dosage cannot be determined through a mathematically rigorous scientific approach. This directly leads us to the topic of common mistakes and inaccuracies when estimating your personal CBD dosage requirements. It is crucial that you educate yourself thoroughly and estimate wisely without blindly shooting in the dark. While some CBD connoisseurs estimate CBD dosages based on body weight alone, this practice may be misleading and somewhat careless. Our colleagues at CBDOrigin recommend that, as a good rule of thumb, you can determine your proper dosage by taking 1-6 mg of CBD for every 10 lbs of body mass based on individual’s level of pain. This might work for some people, but it is a gross oversimplification of the matter. So, let’s break down the correlation between the optimal CBD dosage and body weight in more detail. Firstly, children and adults metabolize medicines in a different manner and have different body chemistry. This means that toddlers may be able to tolerate higher doses of cannabis oil, including THC-rich formulations. Hence, it is not a wise approach to calculate the CBD oil dosage for adults based on what is effective in children. For example, let’s say that a child requires a starting dose of 1 mg of CBD per kg of body mass. An adult may naturally weigh 10-15 times more but it is erroneous to assume that the appropriate starting dose of CBD for an adult is thus 10-15 mg/kg. It is very likely that this would be an excessive starting dose. Even though CBD does not have any significant side effects for large doses (drowsiness is most commonly reported), excessive CBD dosage may reduce its therapeutic efficacy when compared to the efficacy associated with a moderate dose. Furthermore, animal preclinical studies are awesome and provide us with a lot of insight into the effects of CBD. However, it is a bad idea to estimate your personal CBD dosage requirements based on these studies! Human body chemistry and metabolism differ from that of rodents and care should be taken to avoid trusting the data from animal models. Last but not least, always consult your doctor about CBD dosage when in doubt, especially if you already have an underlying medical condition. Most healthcare professionals are not formally trained with CBD since this is a relatively new and exciting field. However, they should have a good idea about how your body may react to CBD and they will be able to recommend a starting CBD dose for your particular ailment. The following section provides essential CBD dosage guidelines and recommendations. I wholeheartedly recommend that you utilize these estimates rather than perform arbitrary calculations based on your body weight or any other single factor. In this section, CBD dosage recommendations are provided for a wide variety of ailments based entirely on scientific research and expert opinion. CBD/THC dosages depend predominantly on the specific ailment with countless other factors playing a role. The same tends to be true when analyzing the timescale required for successful cannabinoid treatments. Loss of appetite is common among cancer patients, and a study in the Annals of Oncology journal demonstrated that an effective cannabinoid treatment for appetite stimulation consists of a daily dose of 2.5 mg of THC taken orally with an optional 1 mg of CBD for 6 weeks (https://academic.oup.com/annonc/article/22/9/2086/211788). A review by Russo in the Therapeutics and Clinical Risk Management journal outlines a potential treatment for chronic pain with daily CBD dosages of 2.5-20 mg taken orally with or without THC (https://www.ncbi.nlm.nih.gov/pmc/articles/PMC2503660/). Eight epileptic patients and volunteers were administered a daily dose of 200-300 mg of CBD taken orally for four and a half months (https://www.ncbi.nlm.nih.gov/pubmed/7413719). All patients and volunteers tolerated CBD very well. Half of them experienced excellent results and remained almost free of convulsive attacks throughout the experiment while three patients witnessed a partial improvement in their clinical condition. CBD treatment was ineffective for one of the patients. A scientific review study published in 2015 in the Movement Disorders journal showed that the appropriate daily CBD dosage for movement issues associated with the Huntington’s disease is 10 mg per kg of body mass taken orally for six weeks (https://www.ncbi.nlm.nih.gov/pubmed/25649017). A systematic review of CBD in humans published in the Pharmaceuticals journal outlines a potentially effective treatment for sleep disorders consisting of a daily CBD dose of 40-160 mg taken orally (https://www.ncbi.nlm.nih.gov/pubmed/24281562). A review by Kluger et al. examines the basic science and preclinical and clinical studies on the therapeutic potential of cannabinoids as relating to movement disorders (https://www.ncbi.nlm.nih.gov/pubmed/25649017). Hereby, multiple sclerosis studies reveal that a potentially effective treatment may utilize a cannabis plant extract containing 2.5-120 mg of a THC/CBD mixture to be taken daily for 2-15 weeks. Schizophrenia may be treated with a daily CBD dosage of 40-1280 mg taken orally as reviewed by Iffland et al. in the Cannabis and Cannabinoid Research journal (https://www.ncbi.nlm.nih.gov/pubmed/28861514). A study published in the Journal of Glaucoma suggests that a single sublingual CBD dose of 20-40 mg may be an effective treatment for ocular hypertension or early glaucoma (https://www.ncbi.nlm.nih.gov/pubmed/16988594). However, doses higher than 40 mg may cause adverse effects by actually increasing the eye pressure. Before learning how you can accurately measure your CBD dosage, it is important to introduce the concept of bioavailability and explore and compare different ways in which CBD can be consumed. This process will significantly assist you in selecting the optimal choice for your personal circumstances. Thus far, this article predominantly focused on CBD dosage while bioavailability has not been discussed. It is important to note that bioavailability also plays a significant role in your CBD intake. To summarize this concept briefly, bioavailability is the degree and the rate at which a substance is absorbed into your bloodstream. Bioavailability varies wildly for the CBD range of products – 5% for oral capsules and gummies, 20-30% for oils and tinctures (well absorbed sublingually), and 30-40% for vaporization products. Medical studies report bioavailability rates all the way up to 56% for vaporized CBD which provides by far the most effective method for CBD consumption (excluding intravenous) and will generally give you the most bang for your buck. Vaporizing CBD may not be the most discreet and socially acceptable method of CBD consumption. For example, if you require a CBD dose during work hours in order to control your back pain, CBD capsules and gummies are your best friend even though they are pricier in the long run due to their low bioavailability! The same holds true if you are hell bent on accurately measuring your daily CBD intake –keep in mind that capsules and gummies will facilitate this endeavor but only approximately 5% of the consumed CBD content will ultimately enter your bloodstream. CBD oils, tinctures, and drops should be applied sublingually for a minimum of 60 seconds. This time period allows for absorption via the blood vessels underneath your tongue to take place which effectively bypasses the first-pass metabolism. Feel free to swallow the CBD oil after a minute has passed. CBD edibles tend to have a slower but a long-lasting effect while delivering a well-determined amount of CBD in a discreet manner. Generally, these products take half an hour to two hours to “kick in”. The long-lasting effect associated with these products is due to their slow digestion and absorption into the bloodstream, i.e. low bioavailability. CBD eLiquid and vape cartridges are similar to e-cigarettes and excellent when seeking an immediate response and high bioavailability. Simply exhale the air from your lungs and inhale through the mouthpiece slowly for a few seconds. After this step, breathe additional air to fill up your lungs and hold for a few more seconds until exhalation. CBD topicals are a great way to enjoy the benefits of CBD but are mostly used only to alleviate localized aches and pains. These products offer relief without the psychotropic effects associated with THC. However, further clinical research on humans is required in order to obtain full evidence of the actual potency of topical CBD treatments. How can you accurately measure your CBD intake? So now that you have estimated how much CBD you may need to start off and have selected the optimal CBD product for your personal circumstances, how do you ensure that you are consuming that exact amount? This matter can be tricky and confusing even though it is based on simple math (unlike rough CBD dosage requirements estimations). Hereby, the different forms of CBD products available on the market will be examined in terms of how you need to go about accurately measuring your CBD dosage. Firstly, let’s start with CBD oils, tinctures, and drops. Basically, you need to establish how many drops are needed to reach your predetermined target dosage. I recommend that you utilize the following CBD dosage calculator to make your life easier if you are looking to use a CBD oil product sublingually in a standard manner. Essentially, you have to read the product label and calculate the number of milligrams of CBD in each drop and thus the total number of drops required to reach your target dosage. Secondly, CBD edibles such as oral capsules and gummies allow you to easily keep track of your CBD consumption since you know exactly how many milligrams you are taking. The packaging always includes the number of milligrams of CBD in each edible and the typical range is 10-25 mg of CBD per capsule or gummy. Finally, vaporized CBD products tend to make it difficult to estimate your exact CBD intake. While sublingual liquids allow you to estimate the dosage through simple mathematical calculations, with vaping it is generally recommended to take one or two inhalations and wait for a few minutes. If you do not obtain any relief whatsoever, repeat the process until you do.